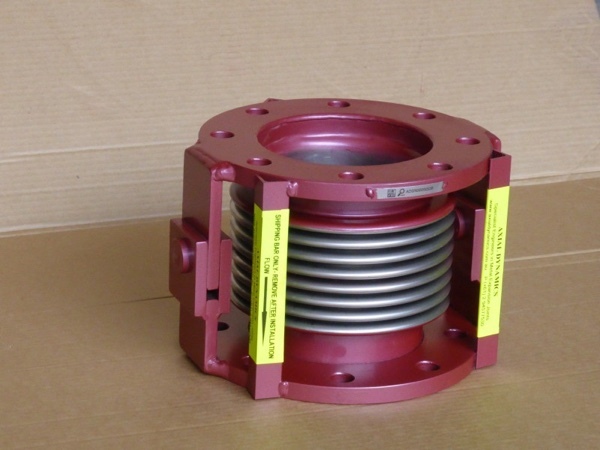 Pressure thrust is the single most important factor for bellows in pipelines. The pressure thrust’s axial force can potentially cause bellows failure and make the pipeline yield or deform. All unrestrained bellows installed in a pipeline without correct anchors or guides can cause instability of the system when pressurised. The higher the pressure, the higher the force. Pressure thrust is the least understood principle in bellows application and selection. 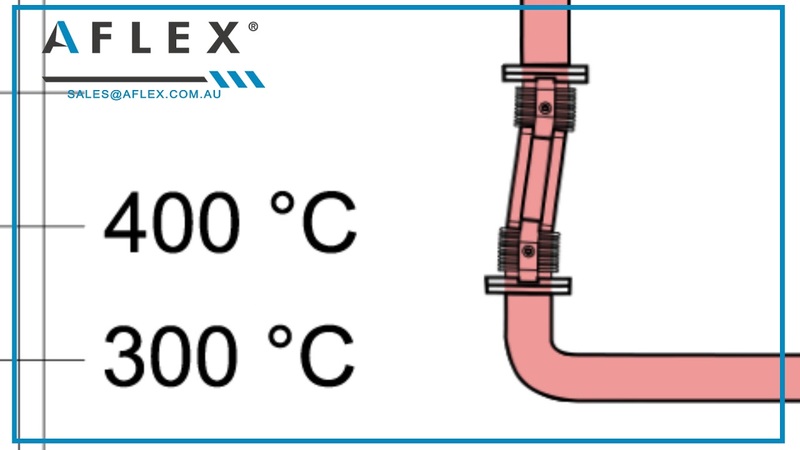 At Aflex, we have observed over the last 30 years approximately 70% to 80% of bellows failures in pressurised pipelines are due to pressure thrust. End users, re-sellers or consultants are commonly unaware of pressure thrust and its effects. Often a much more suitable bellows can be installed that requires less anchoring, less guiding, fewer bellows, and overall a much cheaper solution. 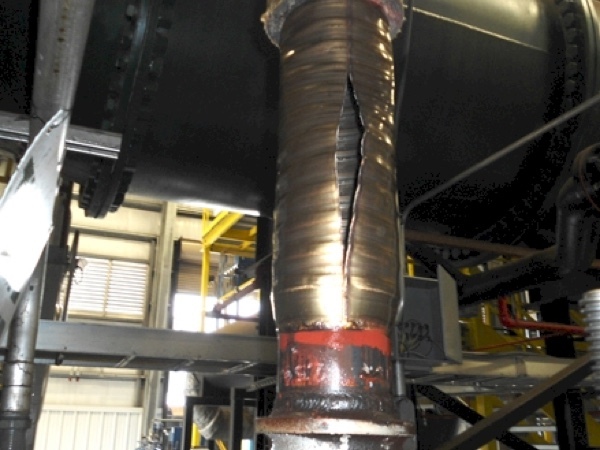 Working closely with Aflex on the bellows recommendations results in significant savings and the avoidance of potential failures and rectification costs. When a pressurised pipe is guided and anchored correctly unrestrained bellows (EG SEB type) will function properly. Without proper pipe guiding and anchoring, failure is a high probability with high stresses being a certainty. 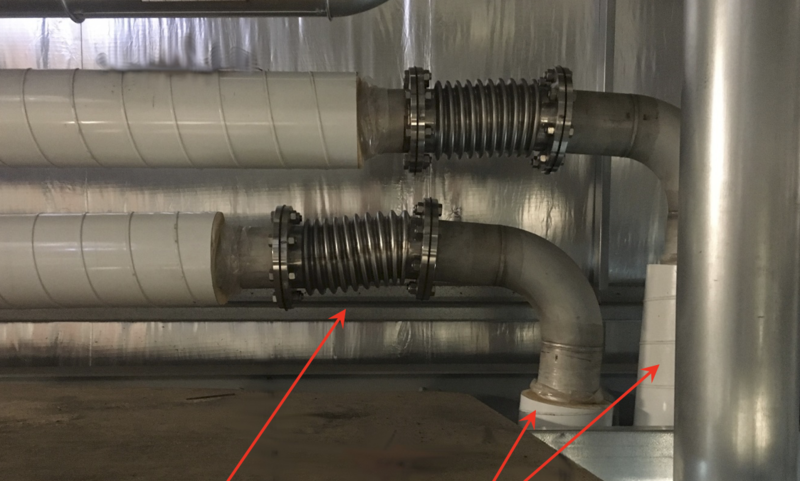 When a bellows with external hardware (DHEB, DGEB or similar) is correctly selected for the pipeline, the bellows and system will function properly. Thrust forces in restrained bellows that could damage the pipeline are contained within the bellows assembly by the hinges or gimbals when the assembly is positioned at 90° to the axial expansion. Pressure thrust forces and bellows spring rate forces are two separate load factors. All unrestrained bellows – metal and rubber – will exert an axial force when pressurised. As a separate issue – Rubber bellows are often installed in the belief that they will accept axial compression without anchors or guides. Without proper anchoring and guiding a rubber bellows is not compressing at all and is stressing the pipe joints. Many rubber bellows simply do not work. The force generated by any bellows is Pressure x Area = Force, the same as if a bellows were a hydraulic ram. 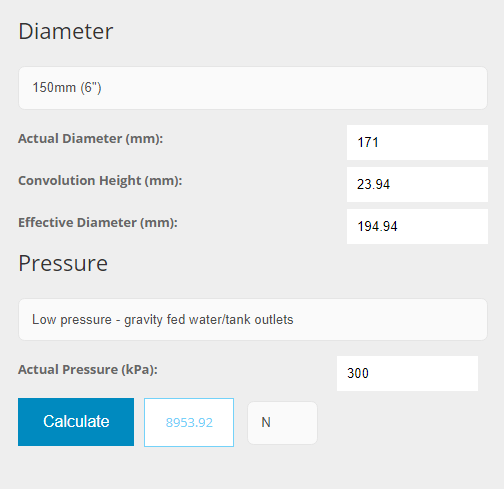 To check the pressure thrust force see our online Pressure Thrust Calculator – try it! Its difficult to picture this in a normal piece of hard piping, but even between two fixed points in a hard pipe, there is a force trying to separate or break the pipe in the axial direction – however, since the pipe material is strong, the force results in no observable deflection – nonetheless, a stress is induced in the longitudinal direction in the pipe. When you introduce a pipeline component which is flexible – like a metal bellows, a silicone coupler, etc, it is then more obvious that this thrust force exists. The flexible component will deflect as the thrust force is able to overcome the components stiffness and the stiffness of the connecting pipework. You can see an illustration of this in the diagrams above – when there is no pressure in the pipe, there is no thrust force generated – but when pressure is added, the thrust force acts to try to make the bellows longer. 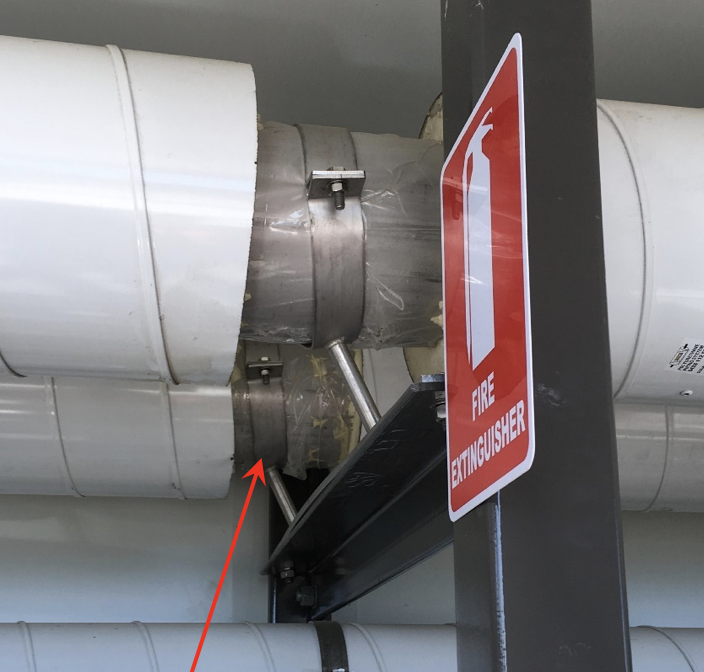 This can be a real problem if the thrust force is high, and if the pipe work is not designed to cope with these forces. When 150nb bellows at 300Kpa were pressurised, they exerted Approximately 8900N (about 900kg) of load. The anchors distorted and the pipe bent. Significant rectifications and repair were required on site. The image on the right is from our online our pressure thrust calculator. Try it here – Pressure Thrust Calculator. 300 Kpa doesn’t seem like a very high pressure, but that’s almost a tonne of load acting on the pipe. Whenever force is applied at a cantilever, at an elbow and pipe in this case, the pipe will bend or be highly stressed. This “real life” thrust example was chosen specifically to show how a relatively low pressure, 300 Kpa, and relatively small diameter, 150nb, can cause failure. Consider then something like 250nb at 1000Kpa exerting around 7.5 Tonnes, like hanging a bus off the end of the pipeline. In the photos bellow, the anchors have bent and the 150nb pipe has been pushed over. 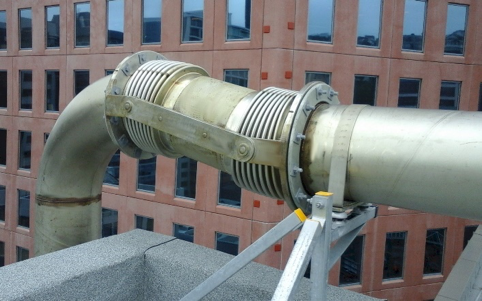 There were other similar SEB bellows installations in that plants pipeline system which required major rectification. The correct bellows for this application is to fit a DHEB assembly in the 90° vertical run, which replaces approximately 4 unrestrained bellows. See our DHEB configuration at this link for a clearer understanding of this principle. 900Kg approximate load (8900N) pushes the pipe from right to left on the weak anchor causing it to bend. The same 8900N force pushes from the left onto the elbow causing the vertical pipe leg to bend. The solution in this case is to use a DHEB assembly in the vertical leg. 300nb DHEB in offset position absorbing vertical stack expansion. Often customers and consultants don’t have experience in bellows applications and D.I.Y. bellows selection is often fraught with disaster. Aflex have had 30 years of experience with bellows applications and can help with bellows recommendations if provided with a pipeline diagram. There is one type of bellows that will move axially and not exert a pressure thrust, an In-Line Pressure Balanced Bellows, but these are very expensive. The inline pressure balanced assembly pictured below is a special type of bellow which does not exert pressure thrust but can move axially. 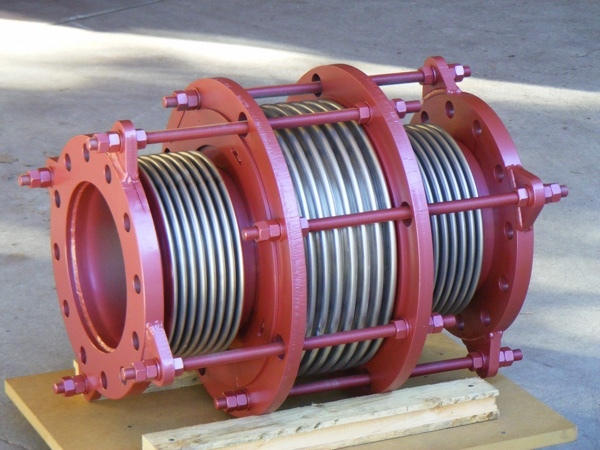 Typically, these types of bellows assemblies are larger, more complicated, offer less flexibility and less movement than a DHEB or DGEB type restrained bellows that is set at 90° to the axial pipe expansion. An unrestrained bellows that has failed due to pressure thrust.